Your favorite video games of 2013 go head-to-head in a 16 member tournament, and you can predict the outcome to win a year of Publisher's Club. The floodgates are now open! We've settled on the final 16 games for the competition - 15 were picked by The Escapist editors plus a little indie darling snagged the last spot as voted by the members of our Publisher's Club. There were some hard decisions to make, but we think we have a pretty good list of the best games of the year. I'm sure you will all begin to argue about which game deserves the mantle as the The Escapist Reader's Choice Game of the Year 2013 - and you can do so at the dedicated forum here - but there's a way for you to prove your predictions. 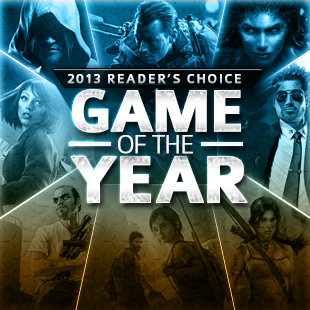 Submit your brackets for The Escapist Reader's Choice Game of the Year 2013 right here. You have to sign in to your account at The Escapist - if you don't have an account, don't worry. You can register for free here or login with Facebook. It's pretty easy. Filling out your bracket is pretty easy too. Check out the 16 games in the bracket and click on a matchup. You'll be brought to a page which shows both games head-to-head, along with some related content in case you aren't familiar with the title and you want to study up before making a decision. Click on the one you think the community will vote for. A link will pop up telling you to go to the next battle. Rinse, repeat. Actual voting on these matchups opens on December 4th and the whole community will have a chance to vote purely on what game they think is more deserving of the Game of the Year mantle. Once the first round of voting is complete, we'll score your brackets and place users in the official leaderboard here. At the end of the event, when The Escapist Reader's Choice Game of the Year 2013 is finally announced on January 1st, we'll tally up the bracket scores and give the top ten submissions a year of Publisher's Club for free. Already a member? Well, you'll get ANOTHER year you can keep for yourself or give to a friend. More detailed instructions on how to participate can be found here. The deadline to submit your bracket is December 3rd at 11:59 pm EST. Get your predictions in before the deadline to be eligible for a chance at winning Publishers Club. May the best prognosticators of The Escapist community reign supreme and may the best game of 2013 win The Escapist Reader's Choice Game of the Year!